Li'l Rascals Academy's Beautiful Campus!! Don't forget, we have an open house at Rascals the 1st Tuesday of every month from 6-8pm. The kids will have a blast and there will be pizza, drinks and cookies. Bring the family. Li'l Rascals Summer Camp Video from LilRascalsKids on Vimeo. 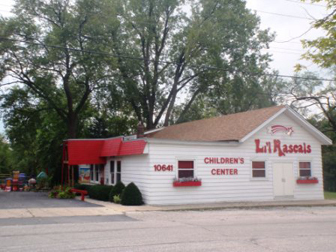 Li'l Rascals Academy, a child care, pre-school, and before and after school center licensed by the state of Indiana. Founded in 1979 in Saint John, Indiana by Georgene Resney; it is now operated by her son and his wife, Geoff & Lisa Resney, who are there daily. Their four children; ages 7 to 2 are 3rd generation Rascals. The loyal staff has been a part of Rascals for many years and make it the place you want your kids to be. These aren't your 18 year old babysitters, but educated, degreed and credentialed, loving and experienced teachers. Rascals Academy sits on 5 acres of private, secured fun-filled, grass, trees and play equipment for endless developmental activities. Your Kids Are Worth It! 2014 Preschool Graduates of Li'l Rascals Academy from LilRascalsKids on Vimeo.